Drafted: Selected by the Indiana Pacers in the first round (14th pick overall) of 1992 NBA Draft. 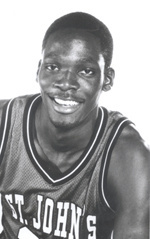 Malik Sealy was killed at the age of 30. He fell victim to a drunk driver in an auto collision on May 20, 2000. Sealy was 8 years into his NBA career and successfully contributing to the Timberwolves. Before Minnesota, he suited up for the Pistons, Clippers, and Pacers, who selected him 14th pick overall in the 1992 NBA Draft. As a St. John's alumni, Sealy earned his degree in business and involved himself in positive off-court endeavors. His budding passion for acting landed him a role in the 1996 movie, Eddie. He founded Malik Sealy XXI to promote his line of men's neckties and was active in the community, investing his time into charities, school programs, and basketball clinics. Sealy's basketball accomplishments include all-time scoring for St. John's, first team All-Big East, and the 1992 Haggerty Award. His #2 jersey is the only retired thus far by the Timberwolves team. The Draft Review remembers Malik Sealy as a husband, father and basketball player, and applaud him for his involvement in community.